SSE YESTERDAY PULLED out of the tendering process for the National Broadband Plan (NBP). Minutes before this statement was released yesterday afternoon, Enet – the consortium with which SSE was working and the sole remaining bidder – confirmed that this group now comprises Granahan McCourt, John Laing plc and the Irish Infrastructure Fund. Yesterday’s announcement was the latest blow to the process, of which Eir also pulled out back in January. 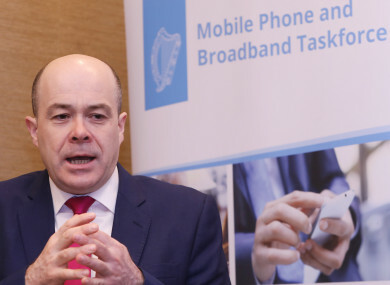 This company had already rolled out company broadband – which is a higher quality, higher speed broadband, to 70% of homes across Ireland – with about 540,000 homes and businesses still remaining to be connected. The NBP aims to give 750,000 premises nationwide a minimum download speed of 30Mbps. This also covers Irish businesses that currently have no access to broadband from commercial operators. Eir, having proceeded with its own rural broadband rollout which took 300,000 premises off the list for the NBP, was thought to have been the most likely winner of the tender before it removed itself from the process. Following on from SSE’s announcement yesterday, opposition parties hit out at the government. Fianna Fáil’s spokesperson on communications Timmy Dooley said the viability of the plan is “now under threat to such an extent that it is conceivable that no contract will be signed this side of 2020″. As of yet, SSE has not outlined its reasons for pulling out but it’s clear as night follows day that the process has to date been so convoluted and bureaucratic that every major commercial player has not felt comfortable continuing. In a statement, the Department of Communications said it is in the final stages of a procurement process to appoint a company to roll out high speed broadband to all houses and businesses in every area of the country. A spokesman said: “The NBP remains on track, with a final bid expected from the e-net consortium in the coming weeks. It is intended the procurement process will reach a conclusion shortly thereafter. “The e-net consortium has reaffirmed its commitment to the National Broadband Plan and timelines around the procurement process. A formal notification from the consortium with regard to structural changes is awaited. “The Government has allocated an initial €275 million in the Capital Plan (Building on Recovery: Infrastructure and Capital Investment 2016-2021), published on 29 September 2015, for the initial years of the network build-out. Email “The department claims it remains on track but what's happening with the National Broadband Plan? ”. Feedback on “The department claims it remains on track but what's happening with the National Broadband Plan? ”.